Mystery bags are a key lesson within Montessori's sensorial curriculum. More specifically it is part of stereognostic sense, or the sense that allows us to understand an object or form through a sense of touch (tactile sense). Not only are Mystery Bags fundamental to Montessori curriculum, they are easy, inexpensive and versatile. 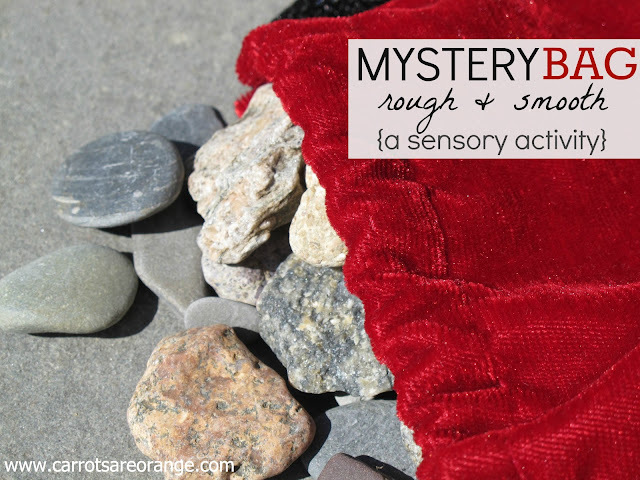 Invite your child over to you by saying: 'Would you like to work with the Mystery Bag today? Open the bag and looking away slowly place your hand in the bag and pull out an object. Together explore each object that you pull out of the bag (I'd have no more than 8 objects to begin this exercise, even less for younger children). Then place the objects back into the bag. Say, 'Now I'm going to use my hands to find a rough rock.' Place your hand in the bag and feel for a rough rock, pull it out, say, 'Rough.' Invite your child to feel the rock. Place the rock in the left bowl or basket. 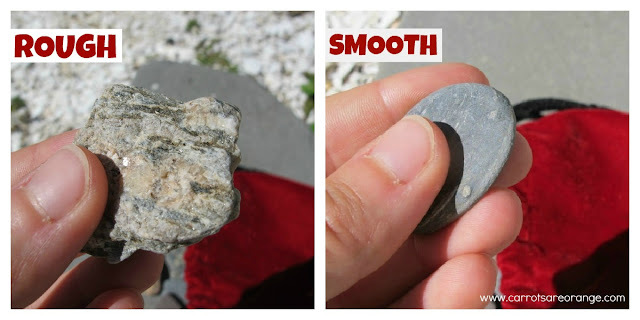 Say, 'Now I'm going to use my hands to find a smooth rock. I think this one is smooth.' Pull it out: 'Yes, it is smooth'' Same procedure as with the rough rock. Place the rock in the right bowl or basket. Please comment, we love to hear from you! Thank you for choosing to read this post today! Marnie writes Carrots Are Orange, a blog she started in 2010 after the birth of her first son. She hails from Maine, a wonderfully down to earth place to grow up. Marnie moved to the west coast in 1999, currently living in Seattle with her husband and two young boys. She is pursuing Montessori certification. Marnie can be found on Facebook, Twitter @orangercarrots, Pinterest and Google +. Marnie I love this idea!! My 10 year old daughter has special needs and very severe language issues, this would be great to help her with her describing words. Thank you!